My August 12 op-ed in the Dallas Morning News is copied below. You can see the online comments here. 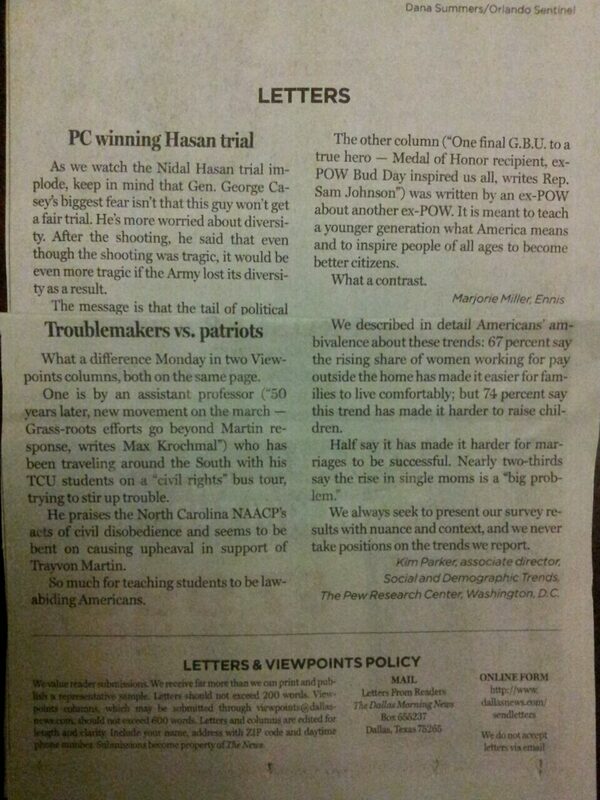 I was also the subject of this amazing letter to the editor. As TCU’s Provost is fond of saying, we are all fighting a war against ignorance. Protesters head for the North Carolina legixlative complex during a July Moral Mondays rally. Recording the memories of Fort Worth activists who fought for equal treatment of women and minorities was a life-changing experience for history professor Max Krochmal’s students. Opal Lee remembers when casting a ballot in Fort Worth meant standing in line for hours and paying a poll tax of $1.75, a lot of money for a family with four kids back in the 1950s. In 1964, the United States ratified the 24th Amendment to the Constitution to prohibit poll taxes in federal elections and the growing Civil Rights movement was slowly changing the segregated South. Fort Worth was changing too, as Jim Crow laws broke down and blacks were allowed to eat, shop and attend movies alongside white patrons. Today, the generation of activists who led the Civil Rights movement are in their 70s and older, and while their memories of those turbulent times are still vivid, they aren’t always recorded. Thanks to Max Krochmal, assistant professor of history, and students involved in his Texas Communities Oral History Project, these moments from times past are being collected and preserved. Students in two of his classes researched then recorded interviews of activists of three major movements of the 20th century — the Civil Rights movement, the fight for Women’s Rights and Mexicano activism. The class grew out of Krochmal’s own love of oral history and his research on the Civil Rights movement in Texas — and how it was intertwined with other movements of the time. “I hadn’t studied Fort Worth very much so I thought it would be a good opportunity to learn more with my students,” he says. Students divided into three groups for each of the movements, then began conducting research, including going off campus to interview activists and record their stories. In May, students presented their research — which includes websites with highlights from their videotaped interviews — to the TCU and Fort Worth communities. “TCU really does value innovation in terms of teaching and research and this is great because it combines those,” Krochmal says. “It’s an undergraduate research opportunity, it’s service learning and community engagement, which are all things TCU supports that many faculty members are trying to do. Reinaldo (Renny) Rosas ’78, was thankful to Krochmal for seeing the importance of recording the history of the area’s Hispanic community. Miles Davison, a senior sociology major from St. Paul, Minn., says he might never have really gotten out into the Fort Worth community if not for the class. Caleigh Prewitt, a junior Spanish and Latin major, says the experience was inspiring. “Learning about activism and talking to people who actually made it happen really made me confident that every person has a leader inside them and everyone can change something in their community if they just have the skills,” she says. For Wynton Brown ’13 the class also brought together the ways each of the three movements were interconnected. She also appreciated how their interview subjects opened their hearts and freely expressed their feelings. The Texas Communities Oral History project seeks to recover, preserve and make openly accessible the history of racial, ethnic, gender and economic groups traditionally underrepresented in historical archives. The project is currently seeking funding for a collection of at least 300 new life history interviews and the creation of a public history website. To make a donation, volunteer to participate or simply learn more, contact Max Krochmal at m.krochmal@tcu.edu or www.professormax.org. TX-COHP Student Websites Go Live! This semester, I taught a pair of undergraduate courses on oral history and urban community activism. Together, the courses represented a sort of pilot program for the larger Texas Communities Oral History Project, an effort to collect, preserve, and make publicly accessible in digital form the histories of the state’s African Americans, Mexican Americans, trade unionists, working people, women, and other marginalized groups. Students in the course spent the semester learning about social change by going off-campus to talk to local community activists. In the last part of the course, they created websites to showcase their findings, including clips from the interviews as well as short interpretive essays. 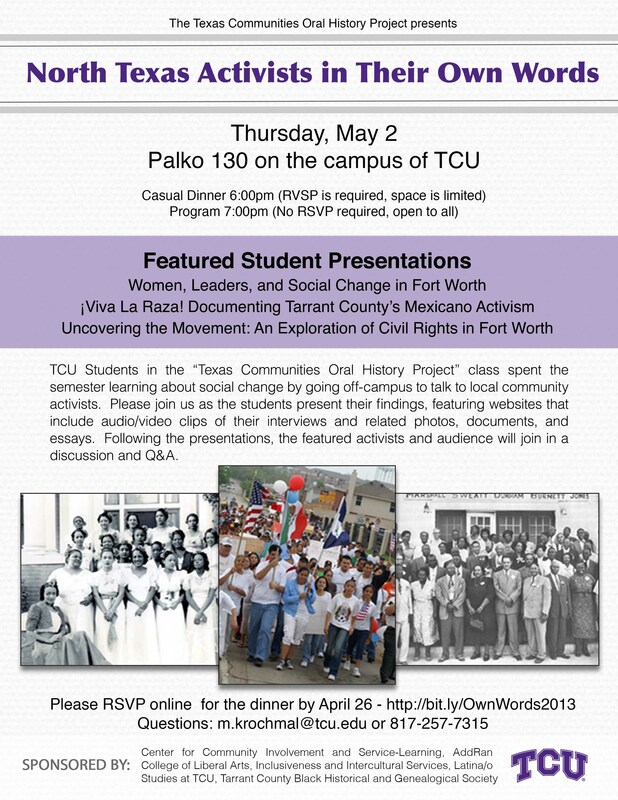 Last night, on May 2, 2013, the students presented their sites at a community dinner in which many of the projects’ narrators and other community members came to TCU’s campus to hear the presentations and participate in a discussion and Q&A. A flyer for the event is included below. April 15 was a sad day with the horrible bombing at the Boston Marathon. It was also a sad day for me due to the death of Sal Castro. Sal was a major figure in Chicano history. As a public school teacher in the East Los Angeles schools, in March of 1968 Sal inspired his students to participate in a historic student walkout of the schools that came to be known as the “blowouts.” The students were protesting a legacy of racial segregation and discrimination against Mexican American students in the public school system — not only in Los Angeles, but throughout the Southwest, where the majority of Mexican-descent people lived. In the early twentieth-century, these schools were referred to as “Mexican schools.” They were segregated public schools for Mexican American children. They were inferior schools characterized by limited education aimed at teaching students to work with their hands rather than their minds, fewer grades than the white or Anglo schools, low expectations by teachers, overcrowded classrooms, and lack of books, etc. Despite efforts by Mexican Americans to change these conditions over the years, the legacy of the Mexican schools was alive and well in the East L.A. schools in 1968. As one of the few Mexican American or Chicano teachers in these schools, Castro knew and opposed such conditions. He also came to understand that only a dramatic action would pressure the educational establishment to do something about them. But more importantly, he knew that only the students could do this — by first recognizing that they were not the problem, the schools were the problem. Castro worked with students to develop a critical consciousness that further recognized that the schools as constituted were not there to help them but instead to limit their opportunities so that they could be recycled as cheap labor, like their parents. Castro believed that the development of this critical consciousness represented real education, as opposed to the regimented “schooling” that the students received that only intended to produce submissive citizens who would not question the inequalities in the American system. Armed with this more critical consciousness and inspired by Castro’s leadership, the students went on strike in what may be the largest high school student strike in American history. Some 20,000 students walked out of 15 schools in the first week of March 1968 in the “blowouts.” Their strike eventually led to various reforms, although even today education in inner city schools leaves much to be desired. But what the walkouts really changed was the consciousness of the students. They recognized that it was within their power to produce social change. No one else could do it but themselves. They empowered themselves by their actions and Sal Castro was largely responsible for this. The blowouts were a seminal moment in the history of the Chicano Movement of the late 1960s and 1970s, the largest and most widespread Mexican American civil rights and empowerment movement in U.S. history. The Movement made Chicanos and other Latinos into major national political actors for the first time, and we are seeing the fruits of that movement today in the rise of Latino political power. Sal Castro paid a price for his leadership and courage by putting his own career on the line for his students. He and 12 others were arrested after the blowouts and became known as the “East L.A. 13.” They were indicted on conspiracy charges and if convicted might have served over 50 years in jail. After a two-year legal battle, Sal and the others were cleared of all charges. The blowouts, a court ruled, constituted an expression of First Amendment rights. Sal continued to be harassed by school officials, but he persisted in dedicating himself to teaching for the next three decades until his retirement. I was privileged and honored to write Sal Castro’s life story in my 2011 book Blowout! Sal Castro and the Chicano Struggle for Educational Justice (University of North Carolina Press). We worked for over 10 years on this project and I conducted some 50 hours of taped interviews with Sal. It was a pleasure and a learning experience to have spent so much time with him and listen to his stories. Sal had a great sense of humor, and he used humor to educate. But he could also get very serious when he talked about the courage of his “kids” who engaged in the blowouts — the blowout generation. When the book came out, we visited many campuses and bookstores and had a wonderful time together. I represented the “teaser” opening, and then Sal did his thing and had the audience in the palm of his hand. Sal also spoke in many of my classes at the University of California, Santa Barbara, and many students over the last ten years and more had the opportunity to meet him and, when the book came out, to read about his story growing up in L.A.: going to both public and Catholic schools, being in the military, returning to go to college, his early teaching career, his involvement in the blowouts, the repercussions he faced, and then his many more years as a devoted teacher. I believe my students were as inspired by Sal as I was. He was the epitome of what it means to be a teacher, and we surely today need teachers such as Sal. But he is also someone who made history — American history — and he needs to be recognized as a major figure in American educational and civil rights history. 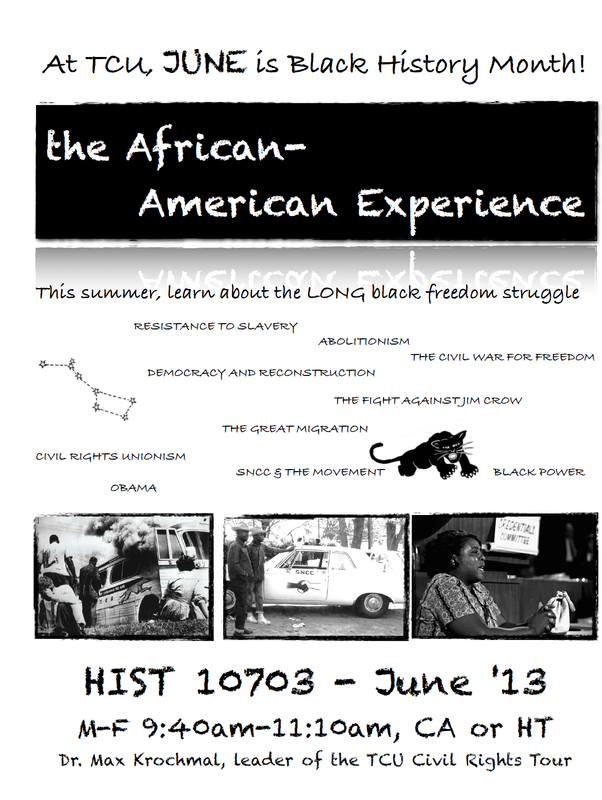 Enroll Now in “The African American Experience” this June! Learn African American history this summer in the June session at TCU! This five-week course is a comprehensive survey of African Americans in the United States from 1619 to 2012, including the slave trade, slavery and resistance, the Civil War and Reconstruction, the age of Jim Crow, the Great Migration, black radicalism, the long struggle for civil rights and freedom, and the status of African Americans today. Students will learn history by doing it hands-on through a series of lab experiments using original primary sources. CA or HT credit. We will read three (inexpensive) books: The Making of African America: The Four Great Migrations by Ira Berlin, We Ain’t What We Ought to Be: The Black Freedom Struggle from Emancipation to Obama by Stephen Tuck, and Walking with the Wind: A Memoir of the Movement by Hon. John Lewis. Four “History Lab Reports” in which students do “experiments” using sets of original historical sources – the Atlantic Slave Trade Database, the Freedom Papers Project (on emancipation and Reconstruction), oral history interviews from Behind the Veil: Documenting African American Life in the Jim Crow South (on iTunes U), and the papers of the most important civil rights movement organization, the Student Nonviolent Coordinating Committee (SNCC). No tests and no final exam! Grades will be based on these assignments as well as attendance, effort, and class participation. About the instructor: Dr. Max Krochmal teaches and does research on African American history, U.S. Latino/a history, labor, and comparative social movements and ethnic studies. A former labor and community organizer, he earned his B.A. at the University of California, Santa Cruz, and both his M.A. and Ph.D. from Duke University, where he studied with the leading civil rights historians in America. He is the faculty leader of the TCU Civil Rights Bus Tour and a passionate advocate for social justice in the community. 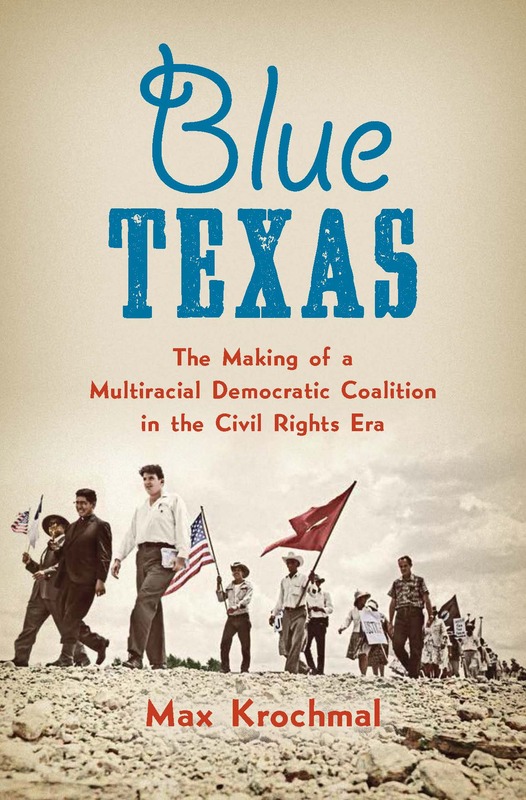 He is working on a book about the history of black/brown/white coalition-building and the multiracial civil rights movement in Texas. For more information, visit his website, professormax.org/. February is Black History Month. 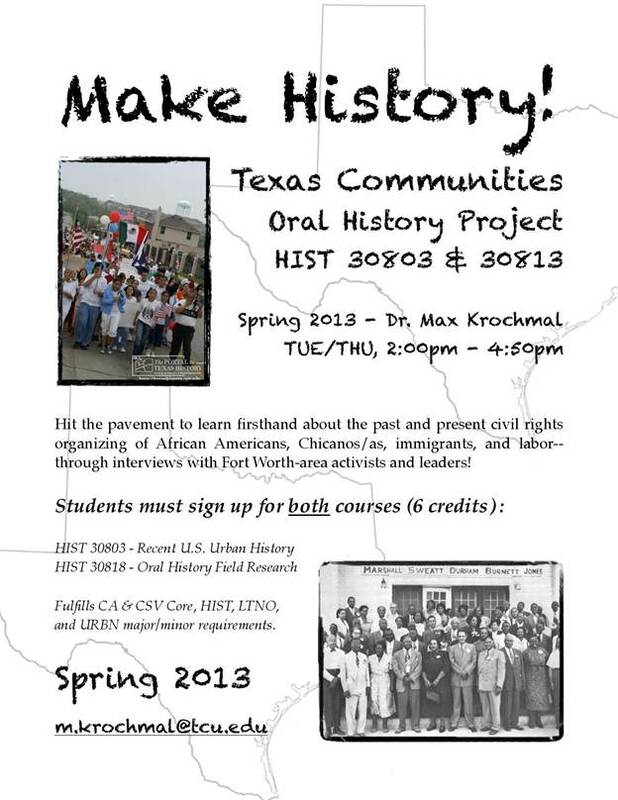 Join us to learn from TCU assistant professor of history Max Krochmal how oral history projects began and their contributions to the history of the South and U.S. race relations. 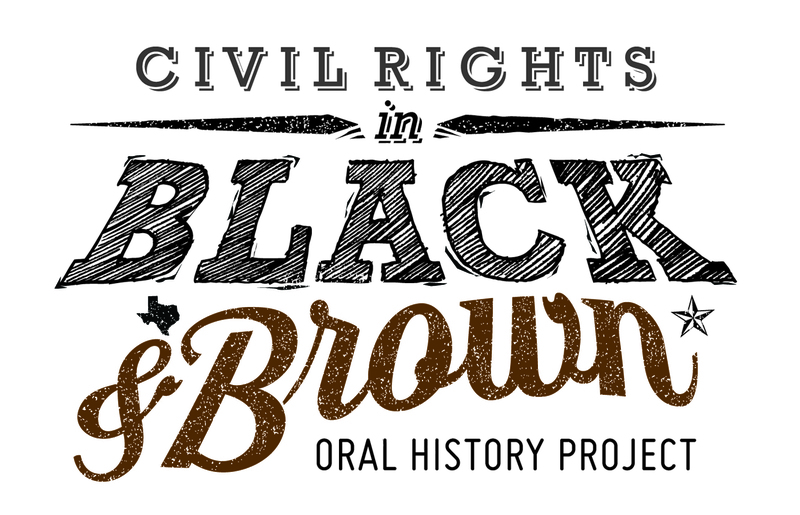 Krochmal will explore forgotten themes in the history of Fort Worth’ black community and introduce the Texas Communities Oral History Project, a program that aims to preserve the history of the civil rights movement in Fort Worth. Saturday, February 2, 10:30 a.m. – Noon, Fort Worth Central Library, Tandy Lecture Hall. Presented in conjuction with The Center for Texas Studies at TCU, these workshops are aimed at increasing the historical awareness of the community. The series is designed to make the public aware of the important, yet often overlooked historical resources around them, and how to preserve them for posterity. The goal of the workshops is to prove that “every person is a historian,” and that they can, by their deeds and actions, preserve a small part of the cultural and historical fabric of this region.